Most of you already know that Sean loves to grocery shop and getting a good deal is a challenge for him! Last week he comes home with the deal of all deals – a HUMUNGOUS package of pork that was half price. Since no one else wants 15 pounds of pork chops…..He froze some and left some in the fridge. I started digging around and threw a few recipes together coming up with this. 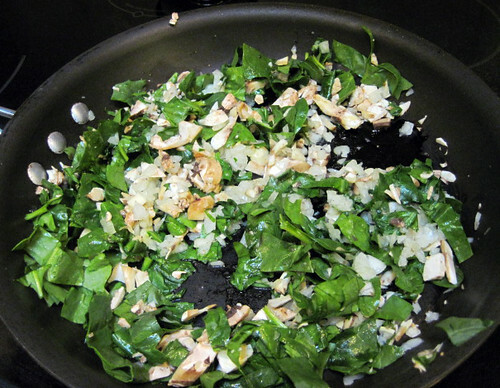 To prepare stuffing saute spinach, mushrooms, onion and garlic in olive oil. When soft add nutmeg, salt and pepper. Cut a pocket in each pork chop and fill with stuffing. Secure close with toothpicks. Roll each chop in flour and brown in butter in a large skillet. Transfer chops to 13×9 inch baking dish. Add wine to skillet and stir until smooth. 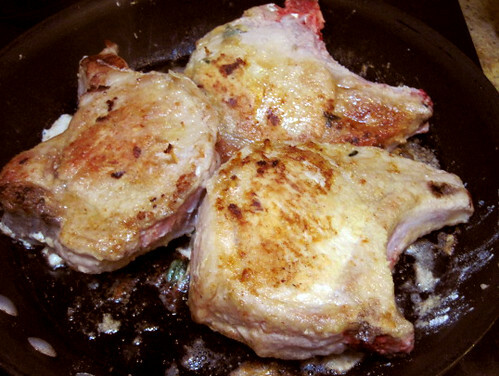 Pour wine sauce over pork chops. Bake at 350 covered for 1 hour. Uncover and bake for 15 more minutes. Remove chops to platter. You can thicken sauce if desired but I just poured it as is over rice. Looks soooooooooooo succulent and delicious! Mmm. 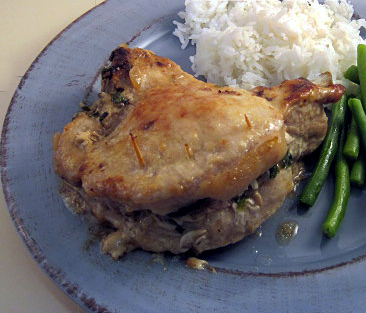 Your pork chops look perfectly carmelized and perfect with rice! Great recipe, Wanda! I can almost smell them cooking…..in butter, no less! Smart cook!! I guess if you have 15 pounds of pork chops you can improvise freely! This one looks like a winner! That Sean! A true member of the clan! Just have to say how gorgeous that looks and how much I love all the ingredients you’ve used! Fantastic! These look fantastic and I’ll bet they smell as good as Emma said. I love pork chops and I never thought to stuff them with spinach… which by the way is one of my fav veg. Drool! I just want to eat it. Lovely pork chops! I love how you’ve stuffed them with colorful spinach! This is absolutely on my list to make! Drool….I see why your daughter gave up being a vegetarian…well, at least for one day. Those sound really good! I don’t stuff pork chops nearly often enough. Thank You for entering the Bake Up Summer Sweets Contest. I hope you are given the opportunity to own a new KitchenAid mixer so you can whip up your fruit pizza recipe with ease.